Throughout the world, EllisDon is known for their impressive accomplishments and reliability in the construction industry. Headquartered in Ontario, this building services giant has spent the last 65 years delivering quality projects and expanding their earnest reputation with every new innovative structure under their belt. While they are still primarily based in Canada, EllisDon has become a global bedrock for construction projects, and with annual revenue surpassing $3 billion, it’s clear they have a knack for prosperity. 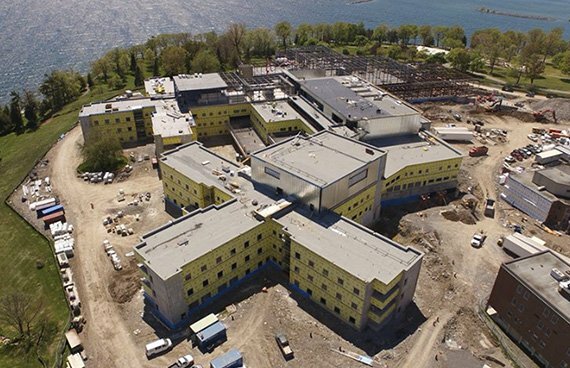 One of their latest mammoth projects is the new Providence Care Hospital in Kingston, Ontario. No stranger to hospital projects, EllisDon’s expertise with this type of work is why Infrastructure Ontario and Providence Care awarded a $350 million contract to them, as part of the overall $800 million tab for the project. They head up Integrated Team Solutions, a consortium of construction companies charged with the project’s November 2017 completion date. Since this mental health hospital is a design-build-finance-maintain (DBFM) venture, EllisDon will be tasked with maintaining the new Providence Care Hospital for a 30 year period once construction is finished. While Providence Care Hospital has a multitude of duties to juggle, Assistant Project Manager Mike Armstrong’s primary focus is managing the scope of the building envelope and any exterior work, such as concrete, landscape, civil, curtain wall and masonry. He’s also one of the most tech savvy members of the EllisDon team, so it fell upon him to find a modern solution to daily field inefficiency. Armstrong also credits Alana Bonney, QA/QC LEED Coordinator, with helping adapt Fieldwire to suit EllisDon’s processes. With anywhere up to 700 workers on-site at any given time, there is a very real need to keep the team both on-task and up-to-date regarding issues that need attention. The massive size of the Providence Care project creates a steady flow of punch items to deal with, and as they rack up throughout the day, Fieldwire becomes vital toward logging and tracking each item’s status. Tasks are created for every deficiency, and the Providence Care Hospital team designates a priority, due date, and category for every task so that expectations are clear. Each individual task collects all of the data pertaining to specific snags, such as notes, photos, checklists, and file attachments. This makes handling every issue a lot easier. The real-time task management system is a core attribute of the Fieldwire construction app, sending both email and mobile push notifications to all associated parties on the project whenever there is an update to each individual task. 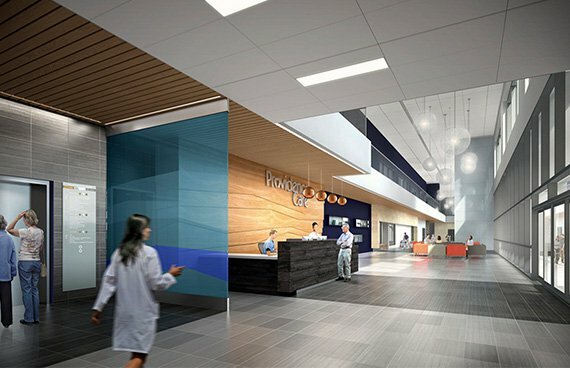 The hospital will include 270 patient rooms on four floors and must meet LEED Silver standards throughout the entire structure, so there is understandably a wealth of progress updates that need to be tracked daily. Being able to manage and monitor tasks in real-time helps turn the stressful notion of keeping an eye on everything into a simple, automatic facet of on-site routine. They even take progress tracking a step further by connecting with EllisDon’s Gate Three ERP system. Utilizing Fieldwire’s open API, EllisDon is able to integrate Gate Three with Fieldwire to make data exchange seamless. By uniting these best-of-breed programs, their team removes the pain of double data entry and further streamlines the way they monitor project headway. Real-time updates also aid in boosting communication throughout Mike Armstrong’s team, allowing them to convey new information immediately instead of hunting each other down to pass along any updates, requests, or hiccups. That makes quite an impact when you’re working on a 30-acre waterfront project site. And even in the absence of WiFi, all the new data can still be recorded in Fieldwire while offline and then sync to everyone else on the team once internet connectivity is reestablished. Collecting all information and data updates in a refined report is another strong communication tool, and Fieldwire helps Armstrong’s crew act autonomously to maximize the time they spend working each day. Armstrong can create PDF or spreadsheet reports on the fly and on a schedule, so that each of his colleagues will receive clear, detailed instructions regarding which tasks need to be dealt with. Beyond assignments, reports are also great ways to convey progress, create inspection and punch lists, and analyze the overall efficiency of team effort. Fieldwire’s efforts to streamline construction projects go beyond task management, but plan viewing and versioning as well. There is no longer any need to struggle with transporting large drawings into the field, as Fieldwire makes it possible to upload every single project drawing directly into the app, where you can version each one and mark them up as you go on your mobile devices. It’s a powerful feature that Armstrong and EllisDon have taken full advantage of, making each day a lot less back-breaking for their comrades on-site. One of the most convenient aspects of plan management in Fieldwire’s construction software is that sheet hyperlinks are automatically read and enabled once the upload is complete. The Providence Care project has a mountain of drawings to keep up with, so being able to navigate through them without creating hyperlinks for every sheet is a tremendous blessing. It certainly facilitated easy adoption of the app throughout the ranks. Creating tasks for each deficiency and placing them directly on their drawings is an advantage that Armstrong and his team have fully embraced. On a project of this scale, this functionality has made a big difference in how they coordinate their contractors and relay information. Those paper drawings remain in-office now in a room that has become akin to a museum. 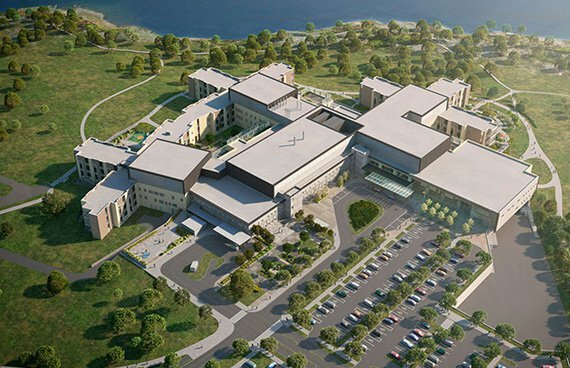 On a beautiful site overlooking Lake Ontario, the new Providence Care Hospital is shaping up to be another massive success for EllisDon. Mike Armstrong and his team have made immense strides toward completing the project, and as the hospital continues to take shape, they continue to rely on Fieldwire to help them boost collaboration and efficiently manage deficiencies. No matter the job or location, the ample benefits that Fieldwire provides can be enjoyed by any construction team ready to improve their daily operations.